Habit: growing from a scaly bulb, Lilium pardalinum can reach heights of 7 ft (2m) tall. Leaves are elongated with smooth margins and are arranged in whorls around the stem. The pale to bright orange red flowers nod downward from long pedicels (the stalk of an individual flower) and can reach 3 in (7cm) wide. Six strongly recurved tepals reveal a lighter orange center covered in maroon spots, with long dangling stamens. One to several flowers are formed terminally in a raceme. Fruit is an elongated capsule containing stacks of flat seeds. Flowering usually occurs in July going dormant in late summer. 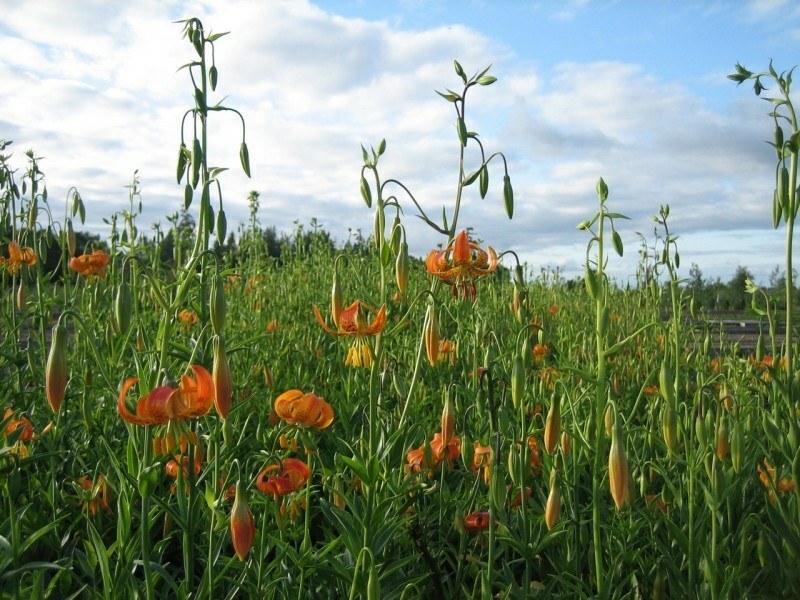 Ecology: found in moist meadows and along streams up to 6500 ft (2000 m) in California and Oregon. Growing Conditions: full to partial shade, in moist, well-drained soil. Great hummingbird plant. Leopard lily is declining in the wild because of habitat destruction and over collection.